Two area residents were honored at the annual Israel Bonds dinner on the 70th anniversary of the state of Israel Sunday night. Donna Bastian, an original organizer of the Leadership Lycoming Program, and Jon P. Conklin, president and CEO of Woodlands Financial Services, were awarded Israel at 70 Protector of Jerusalem awards. 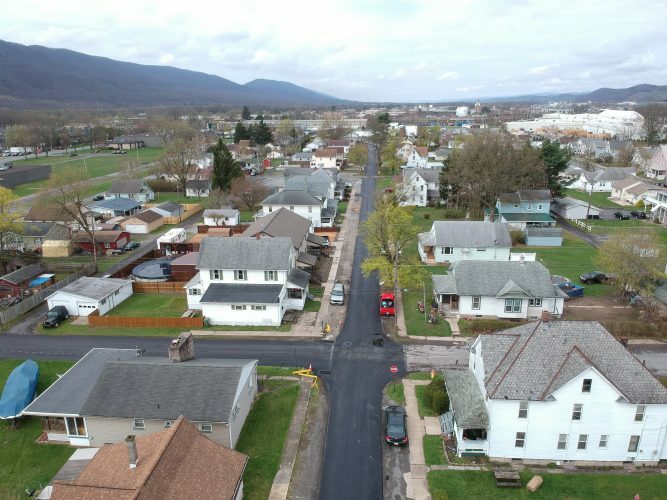 Both Bastian and Conklin also were recognized by state Rep. Jeff Wheeland, R-Loyalsock Township, and Sen. Gene Yaw, R-Loyalsock Township, for their work. In presenting the award to Bastian, Rob Labatch, Hope Enterprise president, praised her community volunteer work. As she accepted the award, Bastian admitted she learned the volunteer concept early in life through her parents. “My mother at 91 and ‘eleven-twelfths’ is here with us tonight. She was our first United Way Campaign chairman to make the campaign over $1 million back in the 80s,” she said. Leadership Lycoming, which she admitted has been one of her passions for the past 33 years, provides a look at the community through non-profits and business. “Our 32nd class is coming up and we’ve graduated about 775 community members who have been through our program,” she said. Bastian urges graduates to find their passions and make the community in which they live better. “I hope that along my journey I’ve helped others by encouraging their growth, the use of their talents, their strengths, their passions to become involved. I hope I’ve served something bigger than myself,” she said. Conklin spoke of the other recipients of the award and the common sense of purpose and drive in their chosen field with a belief that success is not achieved or enjoyed alone. “I believe that success is only achieved when there is an environment conducive to success and, when it is achieve, there is a duty and obligation to make sure that not only the environment remains for those who come after you, but that it is an environment that fosters future success for a much broader range of people,” he said. Conklin also noted his parents’ impact on his work. “I can always remember feeling that it didn’t matter if a person was wearing a suit or if they were wearing dirty blue jeans and a flannel shirt, they were deserving of the same treatment. They were deserving of being treated with respect and finding out each person’s story, their unique story. Who they are at their core. They taught me to understand to never prejudge or underestimate anyone. That people bring much more to the table than you think,” Conklin said. Speaking was Dr. Bernd Wollschlaeger, a board-certified family physician, and author of the book “A German Life: Against All Odds Change is Possible,” which details his struggle coming to terms growing up in Germany, and with the fact that his father was a World War II tank commander and a Nazi officer. He told of being born in the 1950s in a town in Germany, which was over 1,000 years old, but that no one really talked about the time between 1933 and 1945. “My mother and father told me there was a war and we didn’t talk about it,” he said. Wollschlaeger said eventually they did talk about it in reference to his family’s history. “When my father started to talk about it he never stopped. I heard two different stories. The story of glory from my father’s side and the story of horror from my mother’s side,” he said. Wollschlaeger said he thought of his father as a hero because he didn’t know anything else. His mother’s story, however, was totally different. She told of how her family had suffered great losses because of the war. “Glory and horror. These two pictures were painted in my mind,” he said. Wollschlaeger related how years later his father became upset when the Israeli delegation participated in the 1972 Olympics in Germany. When the Israeli team was later murdered, he said people started talking about how the Jews again had been killed in Germany. Wollschlaeger eventually connected with a community of holocaust survivors and, over a period of time, converted to Judaism. He said he put his past behind him and tried to forget, but the conversation with his son brought it out in the open again. “Hatred is not this dark energy, this dark matter in the universe that we just succumb to and then we just hate … It’s something we create every single day by using words of hatred. Misogyny, stereotypes, pointing fingers at others. If these words of hatred are not countered with words of love, if nobody speaks up, these words of hate will fall on fertile ground,” he said.